While I am not quite certain of what meme you are referring to, Mayorcan, might you have a few more words of a more formal or respectable letter structure? Any information would be useful. Even the balance of text type in Sagitta's contribution would be useful to know; subtleties can sometimes hold definitions of perceived character. Besides, considering that nice header which Sagitta created, it makes me want to write another set of letters this week. I'm itching just to give it a try. As mentioned, I wanted to make a list of topics so that my own letters remain relatively diverse, and so that the appreciative regard I have of Tron: Uprising is also kept clear and to the full spectrum that I regard it. Mayorcan Wrote:The meme is irrelevant; it's basically a lot of pictures of signs and letters written in Comic Sans font, and people reacting poorly to it. If you want my advice as a professional, I would change the font to something standard like Times New Roman. 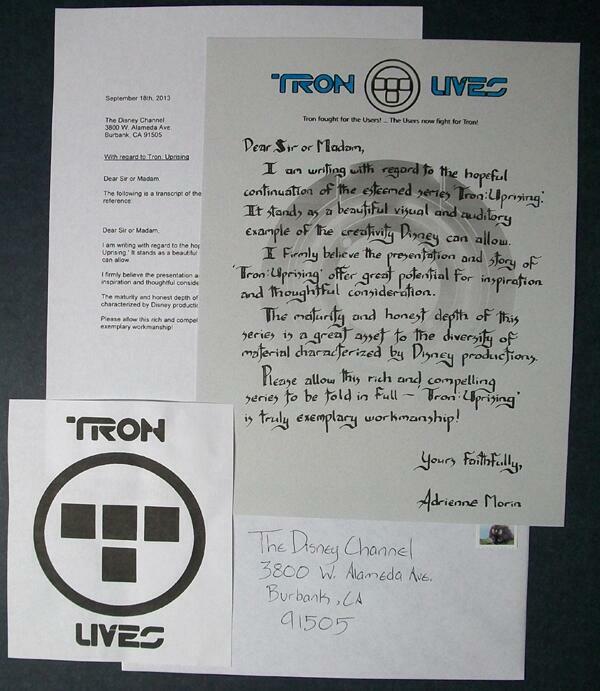 Since this is the fate of Tron Uprising on the line here, treat the letter like you would a resume or job application. You never know who might actually read the letters in the echelons of the Disney corporate hierarchy! LucrataNexarii Wrote:While I am not quite certain of what meme you are referring to, Mayorcan, might you have a few more words of a more formal or respectable letter structure? Both are free to download and use. Here we go! Making that disc was a quick crash course in Photoshop graphics. LucrataNexarii Wrote:Here we go! Making that disc was a quick crash course in Photoshop graphics. A public resource for the Uprising! I hope it proves useful. And thanks to Sagitta for that Tron emblem! Heh, You're right; I had a feeling I'd mess up with that. Unfortunately modifying the aspect ratio isn't so simple, at least not with my graphics engine. In any case, hopefully it proves helpful. I've had something in mind, 'Project DiscThrow,' for trying to drum up more letter-support or activism from fans. Letters are concrete, physical objects, and in today's world of electronic media, a sign of greater effort and dedication. To me, each one counts. It's also one of the most simple, inexpensive, and creative efforts anyone can engage in, in an act of group solidarity towards Tron: Uprising. More material to support that project is something to build on. Also, how to transmit that easily and collectively to various social media is another. I was also thinking of appealing to the various Groups of DeviantArt to post about such a project, once we have some basic graphics or resources up and set for our actions. Nice. Loved how you reworked the lettering as well as added the disc watermark. Disc may be a li'l thick such as Shadowspark indicated, but would think there is room for artistic license. It's not like Uprising didn't have any of it's own. That makes me want to get every Program or fan out there to hit/flood Disney all the harder with letters and praise for Tron: Uprising! ... So many questions and great introductions of new concepts and places and things on the Grid. Though, speaking of fan coordination, do we have any envoys to Youtube and Tumblr yet? Nice job! If you did this on Adobe Illustrator, it's much easier to do it that way using vector paths. But Photoshop does the job nicely as well. However, looking at it just gave me a lightbulb. You do realize that instead of just plastering Tron Lives flyers near Disney's office, one could actually PRINT the Tron Lives slogan on top of a plastic white frisbee? Think about it. You produce a bunch of those and people can throw them to Disney's lawn . Maybe knock it on the CEO's window. lol. This is verging into something more for the 'Tron Lives User Campaign' thread. I like it, though. The projector/'strike' team idea is one matter, but 'protest groups' were another... And 'arming' them with custom Uprising discs would certainly be a thought! LucrataNexarii Wrote:This is verging into something more for the 'Tron Lives User Campaign' thread. Pilgrim1099 Wrote:You guys might want to do a little Tron Lives campaign in comic conventions with a booth. Here we go! This month's letters! I managed to contact Bill Wolkoff via Twitter, and he mentioned he was proud of his work with writing Beck and Paige, but he loves all of it! These letters each contain some praise for him. I'll see who else I can get through to, and offer them a good word in the process! Considering Albeto Mielgo's win of an Emmy award, I'm glad to get back to writing another letter to Disney. It's quite cathartic. I sent in a letter, as well (back in the spring). I also sent in a letter about the other show I've been watching (cancelled in March). I received a response about one, but not about the other. The response I received was not from Disney, but from the recently purchased subsidiary of Disney that was responsible for that show. It's a matter of numbers -- live action teenage sit-coms are more readily produced for less money and the target audience is willing to watch them over and over and over and over again, even though there is no real thinking involved in watching them. I watch Uprising over and over and over again -- but it at least stimulates the brain with ideas and questions, seeking some resolution. (not deresolution).